The power of mapping and geographic information systems lies in their ability to process and visualise large amounts of spatial information through geographic analysis, revealing information, patterns and relationships that enable better communication and decision making. Organisations are increasingly collecting and maintaining locational information relating to assets, vehicles, customers or competitors. 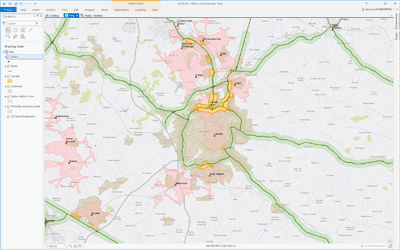 A host of external geographic data can also be utilised in geographic analysis to reveal information about customer demographics, points of interest, optimal routes or environmental risks such as flooding. However, many businesses do not fully exploit locational and geographic information for business intellegence or decision making. 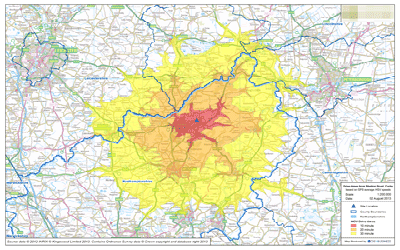 GIS4BUSINESS can help your organisation make better use of geographic information. We can produce custom maps, visualise business data or undertake more complex geographical analysis by overlaying or combining multiple datasets.